How To Stimulate Baby? Parents Must Know - Providing the right baby stimulation early on will have a major impact on his life in the future. Maybe people think that newborn baby, can't understand or respond to things around him. According to a pediatrician, early in life the baby has also used his five senses to search for food and comfort, receive information, and react to his surroundings. The sense of sight does take several months to function perfectly, but other senses such as hearing and touch have fully developed from birth. Playing is the best stimulation method for babies, as babies learn to socialize, move, communicate, and try to understand the world around them. Here are some ideas or ways that baby stimulation can be tried. Parents Must ReadThink Again. Can Your Child Eat Spicy Foods? When newborn, the baby's vision is blurred and can only see something that is 20-30 cm apart, see the size of the object whether large or small and shade bright or dark colors. The baby's vision can develop at the age of 4 months when his eyes can follow the movement of objects and begin to see all the colors. Talking to a baby though is not yet understood with your words. The baby will notice the expression on your face and see our movement. Play peek a boo, especially when the baby starts 4 months old, This game can help coordinate the movement of the eyes and hands of the baby. Take the baby out of the house like a shrine so he sees things differently. Bring the baby to the mirror so the baby can observe her own shadow. Hearing the baby has begun to develop since in the womb because after birth he will be familiar with the sound of his mother. First, the baby will learn to recognize her mother's voice, feel the touch and look at her mother's face. Getting used to smile, talk, and treat the baby gently will make it associate your presence with comfort, warmth, and fulfillment of nutrients. Sing a soft song to calm the baby. Play the soothing music, then hold the baby while moving along the rhythm of the music. Try different expressions such as sticking out tongues and smiling to stimulate the baby. Read a book on a baby can be done even since the baby is still in the womb. Although the baby cannot read yet this activity can form emotional intelligence and can be the foundation later to talk. besides looking at the colorful pictures can please the baby. Toy clatter you can use to train the baby's hearing. 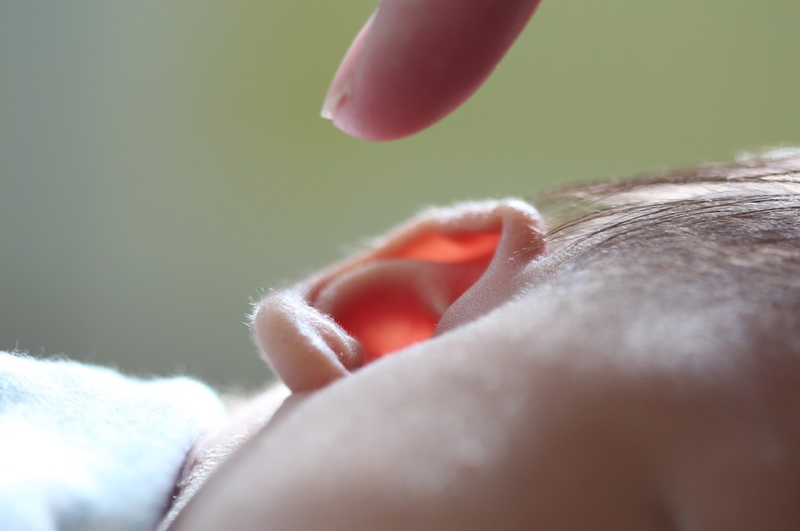 By the age of two months, the baby has begun to try to imitate the sound he heard, start babbling around the age of 4 months, and can imitate the sound you say at the age of 6 months. Since the baby is born, the baby can smell the aroma of breast milk, also can recognize a certain aroma with a sense of comfort and danger. Avoid using perfumes and detergents with a stinging smell, also introduce him to various scents and tell the smell of what he was sensing. Babies can already feel and choose the sweet taste as he got from breast milk. To stimulate the sense of taste, during breastfeeding you can consume different types of foods with different flavors. No need to feel restricted with the toys you have, you can make a game of anything safe for baby to play. But the baby can also be stressful if it gets too much stimulation, and this is marked by movements such as kicking, arm writhing, stretching, and starting to cry. Keep in mind that baby development is not the same so no need to worry if your child has not reacted as expected.